ATLANTA, GA--(Marketwired - June 24, 2015) - Nucleus Medical Media is proud to announce that it has received the 2015 Silver Telly Award for its "Custom Animated Patient Education: Mitral Valve Prolapse" video. The Silver Telly is the highest accolade awarded by the Silver Telly Council. Entrants do not compete against each other, but instead are judged against a high standard of merit established by the Silver Telly Council. The "Mitral Valve Prolapse" video was produced in collaboration with ShareWIK Media Group. It is a unique combination of medical animation and live video. The video features Atlanta-based cardiologist Dr. Randy Martin explaining mitral valve prolapse, a medical condition that can affect the heart and may require corrective surgery. In addition to winning the Silver Telly, the "Mitral Valve Prolapse" video also won an Award of Merit last year at the Association of Medical Illustrators (AMI) Salon. Nucleus credits this win to the efforts of its hard working employees, including animators Stephen Boyd, Eric Small, and (former employee) Walid Aziz; writer Mike Gleason; and editor Mary Beth Clough. Equal credit goes to the team at ShareWIK, who filmed the live video. They include Allie Lemco, Christian Driver, Diana Keough, Joshua Schlabach, and Dr. Randolph Martin. "Our team worked very hard on this project," said Mary Beth Clough, Nucleus's Editor-in-chief. "We are honored to receive this award." In addition to the Silver award for "Mitral Valve Prolapse," Nucleus received Bronze Telly Awards for its "HIV and AIDS" and "Content Marketing for Healthcare: Breaking Down the Silo" animations. Founded in 1979, the Telly Awards is the premier award honoring outstanding local, regional, and cable TV commercials and programs, the finest video and film productions, and web commercials, videos, and films. Winners represent the best work of the most respected advertising agencies, production companies, television stations, cable operators, and corporate video departments in the world. All of the 2015 Telly award winners can be found on the Telly Awards website. Founded in 1997, Nucleus Medical Media, Inc. is an award-winning creator and licensor of medical illustrations, medical animations, and interactive multimedia for the publishing, legal, healthcare, entertainment, pharmaceutical, medical device, and academic markets. Nucleus's clients and partners include WebMD, McGraw-Hill, Dr. Oz, EBSCO Publishing, and thousands of other businesses in new and traditional media. Additional information can be found at http://www.nucleusmedicalmedia.com. ShareWIK produces and distributes health and wellness content that uses the power of personal storytelling to "Engage, Educate, & Inspire" consumers to make better decisions that impact their health. With hundreds of "MyVoice" in-depth patient videos at the core of its product line, ShareWIK syndicates its content to media outlets and licenses its proprietary educational modules to employers, benefits providers, corporate wellness platforms, and other channels within the healthcare industry. 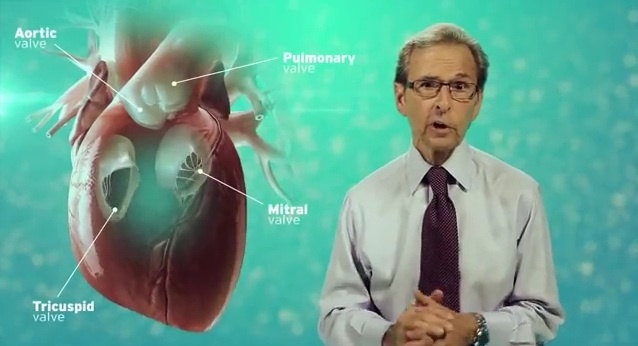 Dr. Randy Martin in the the "Mitral Valve Prolapse" video. The "Mitral Valve Prolapse" video that won a Silver Telly.